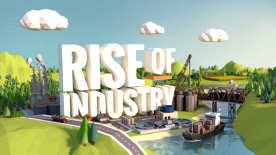 Rise of Industry is lots of fun right now, with the early alpha version already having been on sale for a number of months becoming Itch.io's top selling game of 2017. Feedback already gathered means that we can deliver a very stable build with a host of exciting and enjoyable features. With Early Access we will make it even better and we will work very closely with the community to improve the game as much as possible. We want to make the best and most enjoyable experience possible, and that is not possible if we are in a vacuumed environment. We want to place the game in Early Access at an early stage, so we can get constant feedback and suggestions so that we can deliver the game that you deserve. Weíve already been working hard on the game and we want it to become a modern classic. Your valued feedback in Early Access will ensure that we make this a reality. Our plan is for a Q3-Q4 2018 full release, but expect big updates on a regular basis, with new content and features, plus a lot of bug fixes. You will be kept fully up-to-date should anything change and it will always be for the good of the game - we wonít rush the game for financial reasons - thatís not what weíre about. The full version will have a lot more products to be produced, more factories, more gatherers, new events, bigger maps, pollution, an enhanced tutorial, map creation plus much much more. Modding support will also be added so you can customise and create almost anything in the game to suit your playstyle. The game will also be fully balanced & polished on full release. Only English language is available at the moment but French, Italian, German, Spanish, Russian and Simplified Chinese will all be added before full release. The game is perfectly stable, and constantly evolving. You can build your empire with gatherers, factories and infrastructure. Arrange trade by road, rail, sea or sky, and react swiftly as the economy continuously shifts. The campaign mode will offer you a structured challenge, while contracts and events will keep you on your toes. With all the planned additions, it will feel a totally new experience every couple of months. Balance environmental impact with productivity, trying to meet your neighbouring town's demands.